Sidney Patrick Grauman (March 17, 1879 – March 5, 1950) was an American showman who created one of Southern California's most recognizable and visited landmarks, Grauman's Chinese Theatre as well as Hollywood's Egyptian Theatre, the home of the first Hollywood movie premiere. The film was Robin Hood starring Douglas Fairbanks and the premiere was the opening night of the theatre, October 18, 1922. He was the son of David Grauman (who died in 1921 in Los Angeles, California) and Rosa Goldsmith (1853–1936). Grauman's parents were theatrical performers on various show circuits. Born to Jewish parents, Grauman and his father went to Dawson City, Yukon for the Gold Rush when he was a young man. He worked there as a paperboy. Since newspapers were scarce, they could command a dollar each. Grauman told a story about a store owner who purchased a newspaper from him for $50. The shopkeeper then read the paper aloud in his store, charging admission to local miners. In the Yukon, the young Grauman learned a lesson which would serve him the rest of his life: that people would willingly pay handsomely for entertainment. Sid and his father began organizing events like boxing matches, which paid them well. It was also in the Yukon that Grauman saw his first motion picture. A failed prospector in the Klondike gold rush, David Grauman initially took his young son to the Klondike with the idea of building a theater there. Though they did not strike gold, both of the Graumans were made considerably wealthy by their Klondike entertainment activities. When his father's sister became ill and he left the territory to care for her, young Grauman remained in Dawson City for a time. His parents settled in San Francisco and Grauman joined them there in 1900. David and his son decided to open a vaudeville theater in San Francisco. Their first venture was on Market Street near Mason called the Unique Theater. Before long they added motion pictures to the vaudeville shows, and another theater called the Lyceum. As the theater manager, though Sid Grauman had seen just about every type of performance, there were some that startled and amazed him, turning down an offer to learn how to swallow swords. The Graumans were also instrumental in establishing the Northwest Vaudeville Company, which stretched from San Francisco to Minneapolis and Portland, Oregon. The association brought quality live entertainment at reasonable prices to the Northwest area of the US. With the Unique Theater gone and the Lyceum unable to be occupied by the Graumans until 1907, father and son appeared to be temporarily out of business when the San Francisco earthquake of 1906 destroyed both the Unique and Lyceum theaters. Sid was able to save one of the theater's movie projectors from the ruins. He was also able to get a tent from an evangelist preacher in Oakland. Putting those together with some pews from a destroyed church, he set up on the site where the Unique once stood. The Graumans posted a sign outside of their makeshift theater that said: "Nothing to fall on you but canvas if there is another quake." The family received a commendation from the City of San Francisco for their help in boosting citizens' morale during the trying times. They operated their tent theater for two years; by that time David Grauman had opened a theater called the New National Theater. The Graumans expanded their theaters within a short period of time, opening the Imperial and the Empress in San Francisco, and branching out further to other Northern California cities. By 1917, the Graumans decided they would relocate to Los Angeles and build theaters there. They approached Adolph Zukor, who would go on to be the owner and founder of Paramount Pictures, regarding a business deal. Zukor agreed to buy the San Francisco theaters off the Graumans and also to assist them with financing in beginning their theater business in Los Angeles. Sid Grauman introduced the flickers to San Jose, California. On February 7, 1903, Sid Grauman opened the Unique Theatre at 20 East Santa Clara Street in San Jose. The theatre presented movies, stock theater companies, amateur nights, and vaudeville acts. The most notable amateur to develop his talent there was Roscoe “Fatty” Arbuckle. The 1906 earthquake demolished the Unique Theatre, and Grauman moved on to Los Angeles, founding the Princess Theatre and Grauman’s Chinese Theatre in Hollywood. By 1918, the first of the three noteworthy Los Angeles movie palaces was open for business: the Million Dollar Theatre. In 1921, David Grauman died suddenly, never able to see the completion of the Egyptian Theatre which opened the year after his death. Now working on his own, Sid Grauman began the building of his last theater, the Chinese Theatre in 1926. It was opened for a premiere on May 18, 1927. There was a crush of onlookers eager to have a glimpse of both the stars attending and the splendor of the building. Many of the fittings were imported from China and Chinese artisans were brought in to create works of sculpture which were originally located in the theater's forecourt and are now housed inside the theater. The forecourt still contains the now-famous celebrity hand and footprints in cement. The tradition began by accident, while the finishing touches were being put on the Chinese Theatre. Two versions of the story have been published; one has Mary Pickford as the actress who stepped in the wet cement on her way to see Sid Grauman's new building, and the other credits Norma Talmadge with the misstep. 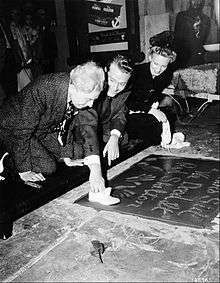 Grauman decided it was a wonderful way to have a permanent record of the stars, and began inviting selected film personalities to put their hand and footprints in concrete. Grauman himself made the choices; the tradition continued after his death using a secret system for choosing celebrities. Grauman was not the sole owner of the Chinese Theatre, even though it bears his name. His business partners in the venture were Mary Pickford, Douglas Fairbanks and Howard Schenck. Two years after its opening, he sold his share of the theater to Fox West Coast Theatres, but remained its Managing Director for the rest of his life. Over four million people visit the Chinese Theatre yearly. Grauman's non-entertainment ventures turned out as badly as his father's. He formed the Black Hills Exploration Corporation in a gold mining effort near Deadwood, South Dakota. Grauman had convinced others such as entertainer Al Jolson and many movie company executives to join him in investing in the company. The company was not successful and Grauman advised everyone to get out of the investment. Grauman was known far and wide among Hollywood's leading stars and was considered to be a close friend to many, including Roscoe "Fatty" Arbuckle. It was in Grauman's office at the Million Dollar Theatre that Arbuckle called the San Francisco police to turn himself in. Arbuckle began working for Grauman as a singer at his San Francisco Unique Theater as R. C. Arbuckle. The San Francisco theater connections of father and son meant the Graumans knew people like Charlie Chaplin and Mary Pickford, as the stars had performed at one of the Grauman theaters when they were on their way up. David Grauman was the originator of Pickford's "America's Sweetheart" nickname. Grauman, who never married, was devoted to his mother. She was the only non-celebrity whose imprints were taken for display; after Rosa's death, Grauman kept all of her personal effects. Grauman was very closely connected with the motion picture industry and appeared in several cameo appearances that nodded to his fame in Hollywood and further afield in the Gold Rush. Living for 35 years at Los Angeles' Ambassador Hotel, Grauman spent the last six months of his life at Cedars-Sinai Medical Center, but not because of illness. Grauman liked being at Cedars and would leave to eat at various premiere restaurants and return to the hospital to sleep. Grauman received an honorary Academy Award in 1949 for raising the standard for film exhibition. He has a star on the Hollywood Walk of Fame at 6379 Hollywood Blvd. He was one of the original 36 founders of the Academy of Motion Picture Arts and Sciences (AMPAS). Grauman died of a coronary occlusion at Cedars-Sinai Medical Center in Los Angeles on March 5, 1950. He was interred at Forest Lawn Memorial Park Cemetery in Glendale, California. 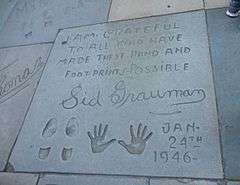 1 2 "Sid Grauman, Hollywood Theater Owner, Dies At 70.". The News and Courier. 6 March 1950. Retrieved 5 June 2011. 1 2 "Death Ends Hollywood Mother And Son Idyll". The News-Sentinel. 11 June 1936. Retrieved 5 June 2011. 1 2 3 4 5 6 Saperstein, Susan. "Grauman's Theaters". San Francisco City Guides. Retrieved 5 June 2011. 1 2 "Sid Grauman Dies; Cinema Showman". Youngstown Vindicator. 6 March 1950. Retrieved 5 June 2011. 1 2 3 "Famed Showman Sid Grauman Dies". The Pittsburgh Press. 6 March 1950. Retrieved 5 June 2011. 1 2 3 Wagman-Gellar, Marlene, ed. (2010). Eureka! : The Surprising Stories Behind the Ideas That Shaped the World. Perigee Trade. p. 272. ISBN 0-399-53589-6. Retrieved 6 June 2011. ↑ "The Little Georgia Magnet At Grauman's Unique Theater". The Evening News. 5 July 1905. Retrieved 5 June 2011. ↑ "Bank Robbers Are Caught". The Evening News. 26 October 1904. Retrieved 5 June 2011. 1 2 The Moving Picture World, volume 29. Moving Picture exhibitors' Association. 15 July 1916. Retrieved 5 June 2011. ↑ "New Novelty Theater". The Evening News. 8 March 1904. Retrieved 5 June 2011. ↑ "She Likes To Swallow Swords". The Evening News. 20 March 1905. Retrieved 5 June 2011. ↑ "A Big Vaudeville Combine". The Evening News. 6 May 1903. Retrieved 5 June 2011. ↑ "Breezy Sid Now In Scranton". The Evening news. 18 October 1905. Retrieved 5 June 2011. 1 2 "Grauman Uses Axe In His Unique Theater". The Evening News. 30 January 1906. Retrieved 5 June 2011. ↑ Arbuckle, Clyde (1986). Leonard McKay, ed. Clyde Arbuckle’s History of San Jose. Memorabilia of San Jose, Copyright 1986 City of San Jose, California, pages 454-455. ↑ "A Brief History of the Egyptian Theater". Hollywood Egyptian Theater. Retrieved 5 June 2011. 1 2 "Chinese Theatre History". Chinese Theatres. Retrieved 5 June 2011. ↑ "Misstep By Actress Started Grauman's Footprint Scheme". Reading Eagle. 6 September 1953. Retrieved 6 June 2011. ↑ Thomas, Bob (15 June 1964). "Hollywood Footprint Story Told". Ellensburg Daily Record. Retrieved 6 June 2011. ↑ "Mine Promoter Loses Big Suit". The Telegraph Herald. 30 April 1937. Retrieved 6 June 2011. ↑ Tracy, M.D. (25 September 1921). "Fatty's Wife Near Tears As Tattered Clothing Of Dead Girl Is Produced". The Pittsburgh Press. Retrieved 6 June 2011. ↑ "She Must Use 7 Mirrors". The Evening News. 31 January 1905. Retrieved 5 June 2011. ↑ Williams, Gregory Paul, ed. (2006). The Story of Hollywood: An Illustrated History. BL Press LLC. p. 416. ISBN 0-9776299-0-2. Retrieved 6 June 2011. ↑ "Sid Grauman, Showman, Dies". Calgary Herald. 6 March 1950. Retrieved 6 June 2011. ↑ Day, Beth (1960). This Was Hollywood. Doubleday. p. 54. ↑ Mosby, Aline (10 August 1956). "You're Not Sick In Hollywood Unless You're Sick At Cedars". The Milwaukee Journal. Retrieved 6 June 2011. ↑ "Olivier, Wyman Award Winners; 'Hamlet' Takes Top Film Honor". Lewiston Morning Tribune. 25 March 1949. Retrieved 5 June 2011. ↑ "Hollywood Walk of Fame Star-Sid Grauman". LA Times. Retrieved 5 June 2011. ↑ "History of the Academy". Academy of Motion Picture Arts and Sciences. Retrieved 5 June 2011. ↑ "Sid Grauman Dies. Theatre Owner, 70. 'Immortalized' Movie Stars by Recording Hand and Footprints in Wet Concrete". New York Times. March 6, 1950. Retrieved 2007-08-21. Sid Grauman, showman and theatre owner, who built the Egyptian and Chinese Theatres on Hollywood Boulevard, died today at the age of 70. ↑ "Rites Honor Sid Grauman". Eugene Register-Guard. 10 March 1950. Retrieved 5 June 2011. ↑ "Paternity Claim Challenged". Tri City Herald. 23 May 1950. Retrieved 6 June 2011. ↑ "Sister Claims She's Mother in Will Case". Lodi News-Sentinel. 23 May 1950. Retrieved 6 June 2011.